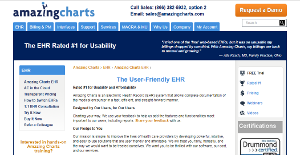 Amazing Charts is an electronic health record solution designed by physicians. It is utilized for independent medical practices and to make family physicians, internists, pediatricians, psychiatrists, and other medical and clinical specialists efficient as they run their practice. In such ways, it allows doctors and physicians to quickly document their patient encounters eliminating re-documentation. Described as an affordable and straightforward Electronic Health Record system, Amazing Charts allows users to do a quick data entry of their patient information which covers charts, schedules, sigs and prescriptions, diagnoses, and clinical decision support rules. The software is accessible from any locations through the Internet using PCs or mobile devices. Highlighting its pre-built templates and drag and drop functionality, this EHR solution aims to optimize office workflow and increase revenues. A prominent feature of Amazing Charts is its E-Prescribing capability. The software is using a built-in program called Script Writer that enables users to prescribe medications to patients in just few clicks, With this script writing program, physicians and medical specialists can quickly generate new medications and need not to do a manual data entry of prescription details which include sig, notes, dispense, refill and course. However, they are still provided with an option to do a free texting of such details. Free texting means users could input information into the prescription fields by typing them. There is one unique capability that Amazing Chart’s e-Prescribing offers. This feature automatically remembers the previous prescribed medications. Hence, when the physician searches for those medications, then they are readily accessible and would show up instantly in the system. Preparation of transcripts transmitted to pharmacies and health care providers is also done easily because there is an option to add a favorites list of pharmacies to patients. As a result, before sending the transcript, users would automatically access the preferred pharmacy to a particular patient or they can search it by name, location, zip, code, or phone number. This feature streamlines the prescription procedure and speed up the delivery of healthcare service. Another feature of Amazing Charts is how it automates and facilitates the scheduling of appointments and booking of visits. Here, we would observe that once a patient is already added into the system, the name of the patient could be drag and drop to a schedule window. From there, the physician could then easily set an appointment with the patient. If the physician haven’t decided yet for the date and time for the visit schedule, he or she could search instantly for open slots just by clicking the “Find It” button. Overriding of visit duration is also made possible in the software as well as the editing, moving, verifying, and reviewing of appointment. This automated scheduling functionality enhances patient experience since schedule adjustments are easily accomplished. Amazing Charts also provides a feature that allows physicians to run various reports that are important in their practice. With this feature, they could quickly search the database by querying into different criteria such as demographics, medications, diagnoses, allergies, health risk factors, or laboratory and orders. Furthermore, they could build complex database queries and add unlimited number of criteria. Amazing Charts’ reporting tool hence is comprehensive and optimizes patient management by providing all the needed information. If you are interested in Amazing Charts it may also be a good idea to analyze other subcategories of Best EHR Software gathered in our database of SaaS software reviews. Each enterprise has different needs and needs a software that can be customized for their size, type of employees and customers, and the particular industry they are in. For these reasons, no platform can proffer perfect features off-the-shelf. When you search a software app, first be sure what you need it for. Read some Amazing Charts reviews and ask yourself do you want basic functionality or do you need sophisticated features? Are there any industry-specific functionalities that you are searching for? Get the answers to these questions to help your search. There are plenty of elements that you need to consider and these include your finances, particular business wants, your company size, integration requirements etc. Take your time, try out a few free trials, and finally select the system that provides all that you need to enhance your organization efficiency and productivity. How Much Does Amazing Charts Cost? We realize that when you make a decision to buy EHR Software it’s important not only to see how experts evaluate it in their reviews, but also to find out if the real people and companies that buy it are actually satisfied with the product. That’s why we’ve created our behavior-based Customer Satisfaction Algorithm™ that gathers customer reviews, comments and Amazing Charts reviews across a wide range of social media sites. The data is then presented in an easy to digest form showing how many people had positive and negative experience with Amazing Charts. With that information at hand you should be equipped to make an informed buying decision that you won’t regret. What are Amazing Charts pricing details? What integrations are available for Amazing Charts? Amazing Charts supports integration with Avalon Laboratory System, a modular LIS software for laboratories. If you need more information about Amazing Charts or you simply have a question let us know what you need and we’ll forward your request directly to the vendor.